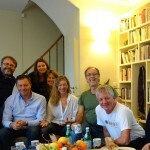 The IAGC began unfolding 4 years ago when Stephen Gilligan and Robert Dilts decided to create a mutual model of Generative change based on their combined 80 years of exploration and their development of cutting edge models flowing from sources such as Gregory Bateson, Milton Erickson, John Grinder and Richard Bandler. Generative Coaching and the Hero’s Journey are some examples of their Generative change models. 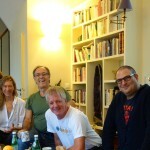 Robert and Stephen are now teaching workshops on Generative change all over the world with certification programs already begun in China, Japan, Russia, Germany, Spain, France, and England. On the 3rd of November, Stephen and Robert, with IAGC representatives from many countries met in Paris to facilitate the next step in IAGC’s development. In attendance were Giorgia Sanfiori and Beatrice Arnaud representing France, Alex Roca Riba and Allan Santos representing Spain, Eva Wieprechtrepresenting Germany, Robbie Steinhouse, Judith Lowe, and Jonathon Goldsmith representing England, and Oksana Konner and Richard Konner representing Russia. 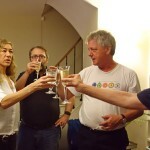 The meeting was held in the lovely Paris home of Robert Dilts and Deborah Bacon Dilts. We spent the day mapping out the plans for what our vision for the IAGC is and how best to enable and train new generations of Generative Coaches across the globe. It was fantastic to be part of this new venture and plans are unfolding over the next few months, watch this space for details!